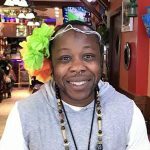 Simone Satchell, an all borough New Yorker identifies as a Black Trans Non Binary Queer artist. Simone’s pronouns are Simone, he, or they. Simone earned a BFA from Queens College in 2008. He was a Public Allies fellow at the Queens Museum as the Coordinator of OST Youth and Family Programs from 2015-2017. Simone is drawn to community engagement and sharing the combination of art, community and healing, especially, to folks who have not had to space or time to consider it. In 2016, he organized and facilitated the Set on Freedom retreat with 4 other interdisciplinary artist to explore the question: How do we work as a community to open up space and support for artists and communities whose main concern is daily survival in order to thrive? He created a 3 part drawing series for families at Immigrant Movement International Corona in 2016 and became a Visionarixs Imaginarixs/ Consejo member in 2017. Simone is excited to be a part of the Gender & Family Project.